TLJ Daily E-Mail Alert No. 1,330, March 16, 2006. March 16, 2006, Alert No. 1,330. 3/15. The House Financial Services Committee amended and approved, by voice votes, HR 4411, the "Unlawful Internet Gambling Enforcement Act of 2006". Rep. Jim Leach (R-IA) offered an amendment in the nature of a substitute [25 pages in PDF]. It was approved by a voice vote. The bill, as amended, was then approved by voice vote, without further amendment. HR 4411 is targeted at the financial transactions that fund what already constitutes unlawful internet gambling. It provides that no one engaged in the "business of betting or wagering" may knowingly accept certain financial transactions, including checks, electronic fund transfers, and credit card debt, in connection with "unlawful Internet gambling". The bill then requires the Department of the Treasury (DOT) and the Federal Reserve Board (FRB) to write regulations that require each "designated payment system" to identify and block these restricted transactions through the establishment of policies and procedures. The bill requires each "financial transaction provider" to comply with these DOT/FRB regulations. The bill contains numerous exemptions and limitations. Summary of Bill. The bill, as amended, does not criminalize any gambling activities. However, there is a separate bill that would amend the criminal code, HR 4777, the "Internet Gambling Prohibition Act". It falls within the jurisdiction of the House Judiciary Committee. HR 4411 recites in its findings that "Internet gambling is primarily funded through personal use of payment system instruments, credit cards, and wire transfers." It adds that "New mechanisms for enforcing gambling laws on the Internet are necessary because traditional law enforcement mechanisms are often inadequate for enforcing gambling prohibitions or regulations on the Internet, especially where such gambling crosses State or national borders." (4) the proceeds of any other form of financial transaction, as the Secretary and the Board of Governors of the Federal Reserve System may jointly prescribe by regulation, which involves a financial institution as a payor or financial intermediary on behalf of or for the benefit of such other person." The bill then goes on to require the DOT and FRB to write regulations "requiring each designated payment system, and all participants therein, to identify and block or otherwise prevent or prohibit restricted transactions through the establishment of policies and procedures reasonably designed to identify and block or otherwise prevent or prohibit the acceptance of restricted transactions". It provides that this may be accomplished this by the "establishment of policies and procedures" that either "(A) allow the payment system and any person involved in the payment system to identify restricted transactions by means of codes in authorization messages or by other means; and (B) block restricted transactions identified as a result of the policies and procedures developed pursuant to subparagraph (A)", or "prevent or prohibit the acceptance of the products or services of the payment system in connection with a restricted transaction". The bill also requires the DOT and FRB to "consider exempting certain restricted transactions or designated payment systems from any requirement imposed under such regulations, if the Secretary and the Board jointly find that it is not reasonably practical to identify and block, or otherwise prevent or prohibit the acceptance of, such transactions." The bill defines "bet or wager" as "means the staking or risking by any person of something of value upon the outcome of a contest of others, a sporting event, or a game subject to chance, upon an agreement or understanding that the person or another person will receive something of value in the event of a certain outcome". The bill provides that "bet or wager" includes lotteries, but excludes regulated securities and commodities, and certain other commercial or financial instruments and activities. The term "bet or wager" also excludes "any participation in a fantasy or simulation sports game, an educational game, or a contest," as defined by the bill. The bill provides that the term "business of betting or wagering" does not include "the activities of a financial transaction provider, or any interactive computer service or telecommunications service." The bill provides that the term "unlawful Internet gambling" means "to place, receive, or otherwise knowingly transmit a bet or wager by any means which involves the use, at least in part, of the Internet where such bet or wager is unlawful under any applicable Federal or State law in the State or Tribal lands in which the bet or wager is initiated, received, or otherwise made." However, it does not include intrastate gambling, gambling authorized by any state if it is "reasonably designed to block access to minors and persons located out of such State", or gambling that does not violate the Interstate Horseracing Act or the Indian Gaming Regulatory Act". Nor does the term "unlawful Internet gambling" include gambling on certain Indian lands. The bill provides a limitation on liability for blocking financial transactions. It provides that "A person that identifies and blocks a transaction, prevents or prohibits the acceptance of its products or services in connection with a transaction, or otherwise refuses to honor a transaction ... shall not be liable to any party for such action" if either the transaction is restricted, the blocker reasonably believed it to be restricted, or the blocker relied on the policies and procedures of the payment system of which it is a member. Debate and Discussion. 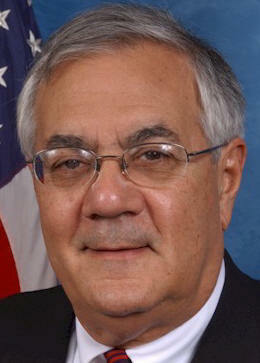 Rep. Barney Frank (D-MA), the ranking Democrat on the HFSC, spoke in opposition to the bill. He said that "adults are entitled to do with their own money" whatever they want, so long as it does not harm others. He added that "the fact that people bet more than they should" is not cause for Congressional legislation. He pointed out that some people eat more than they should too. Rep. Frank (at right) invoked the moral philosophy of John Stuart Mill (see, On Liberty and Other Essays [Amazon]), and the principle of freedom of the internet. He also lamented, when no one else spoke against the bill, "Where is Ron Paul when I need him." Rep. Leach stated at the mark up that similar bills in the past have been held up in ways that do not reflect well on the Congress. Rep. Leach spoke with reporters after the hearing. He offered this explanation of why the Congress may now enact internet gambling legislation. He said that "There are two broad changes. One is that the growth in internet gambling has produced more and more instances that have been reported to Congress of tragic abuses that have occurred with the individual family." "Secondly," said Rep. Leach, "Congress is in certain disrepute. This is part and parcel of what I consider to be a necessary to clean up the Congress." TLJ spoke with Rep. Bob Goodlatte (R-VA), the sponsor HR 4777, on March 15. He said that for five years internet gambling legislation was blocked as a result of misrepresentations by Jack Abramoff. He added that now that this has been disclosed, he is hopeful that the Congress will enact legislation. On January 3, 2006, Abramoff pled guilty in U.S. District Court (DC) to a three count information charging him with conspiracy (in violation of 18 U.S.C. � 371), aiding and abetting honest services mail fraud (18 U.S.C. �� 1341 and 1346), and tax evasion (26 U.S.C. � 7201). See, DOJ release and plea agreement [29 pages in PDF]. This case is U.S. v. Jack Abramoff, U.S. District Court for the District of Columbia, Judge Ellen Huvelle presiding. The plea agreement states that Abramoff was a lobbyist who "solicited and obtained business with groups and companies throughout the United States, including Native American tribal governments operating, and interested in operating, gambling casinos." It continues that "Abramoff was hired by at least four Native American tribes with gaming operations to provide professional services and develop programs to limit market competition or to assist in opening casinos." The plea agreement also addresses Abramoff's efforts to stop internet gambling legislation in the 106th Congress. It states that "beginning at least in 1999 through January 2001, Abramoff and others sought Staffer A's agreement to perform a series of official acts, including assisting in stopping legislation regarding internet gambling and opposing postal rate increases. With the intent to influence those official acts, Abramoff provided things of value including, but not limited to, from June 2000 through February 2001, ten equal monthly payments totaling $50,000 through a non-profit entity to the wife of Staffer A. The total amount paid to the wife of Staffer A was obtained from clients that would and did benefit from Staffer A's official actions regarding the legislation on internet gambling or opposing postal rate increases." Rep. Goodlatte said that "Nearly 60 percent of the members of the House voting voted for this once before, when it was brought up on suspension. It didn't get the two thirds, but we had nearly sixty percent." This is a reference to the House vote on July 17, 2000, on HR 3125 (106th Congress), titled the "Internet Gambling Prohibition Act". It was considered under a suspension rule, which meant that it required a 2/3 majority to pass. It failed by a vote of 245 to 159. See, TLJ story titled "House Rejects Internet Gambling Prohibition Act", July 18, 2000, and TLJ story titled "Analysis of House Vote on HR 3125", July 23, 2000. Rep. Goodlatte concluded, "Add to that all of the misinformation. I mean, a number of people who were quite frankly misinformed by Mr. Abramoff have come to us and said we want to be on this bill." HR 4777 currently has 130 cosponsors. Rep. Goodlatte said that the HJC will hold a hearing on internet gambling before markup. However, he did not know when either might take place. 3/15. The House Judiciary Committee (HJC) approved a resolution by voice vote without amendment that creates a HJC temporary task force on telecommunications and antitrust. The resolution, titled the "Telecommunications and Antitrust Task Force Resolution of 2006, provides that "There is hereby established in the House Committee on the Judiciary ... a task force to be known as the House Committee on the Judiciary Telecommunications and Antitrust Task Force of 2006 ..."
The term of the task force will be April 1 through September 1, 2006. The Chairman and ranking Democrat on the HJC will be the Chairman and ranking Democrat on the task force. All HJC members will be members of the task force. There was little discussion of this resolution. Rep. James Sensenbrenner (R-WI), the Chairman of the HJC, and Rep. John Conyers (D-MI), the ranking Democrat, both spoke in support. Rep. Conyers expressed concern over the recently announced merger of AT&T and BellSouth. The resolution states that the task force "shall conduct such hearings and investigations relating to the Committee's jurisdiction under clause 1(l)(16) of House Rule X and other matters as directed by the Chairman of the Committee." House Rule X provides that the HJC has jurisdiction over "Protection of trade and commerce against unlawful restraints and monopolies". However, this rule also provides that the House Commerce Committee has jurisdiction over "Regulation of interstate and foreign communications" as well as "consumer protection". 3/15. The House Judiciary Committee (HJC) approved HConRes 319 by voice vote without amendment. This resolution expresses the sense of the Congress that the Bayh-Dole Act has made substantial contributions to innovation and the economy. The Bayh-Dole Act was enacted into law in 1980. It is Public Law 96-517. It is codified at Chapter 18 of Title 35 of the U.S. Code. See, 35 U.S.C. �� 200-212. The resolution recites numerous findings, including that "federally-funded research at universities and Government laboratories and the partnerships between such nonprofit institutions and the private sector play a critical role in developing the technologies". The resolution concludes that the Bayh-Dole Act "has made substantial contributions to the advancement of scientific and technological knowledge, fostered dramatic improvements in public health and safety, strengthened the higher education system in the United States, served as a catalyst for the development of new domestic industries that have created tens of thousands of new jobs for American citizens, strengthened States and local communities across the country, and benefitted the economic and trade policies of the United States". Rep. Lamar Smith (R-TX), Rep. John Conyers (D-MI), and Rep. Maxine Waters (D-CA) all spoke in support of the resolution. The resolution was approved by a voice vote. While there was voting quorum present for the vote, almost all members did not voice a vote. Rep. James Sensenbrenner (R-WI), the Chairman of the HJC, declared after the vote that "the aye appears to have it". 3/15. The House Judiciary Committee (HJC) approved HR 4742, by voice vote without amendment. This is an untitled bill to amend the Title 35 to allow the USPTO to waive certain statutory provisions in the aftermath of disasters. Rep. Lamar Smith (R-TX), the Chairman of the HJC's Subcommittee on Courts, the Internet and Intellectual Property spoke in support of the bill. He said that it will enable people to maintain their intellectual property rights in the aftermath of hurricanes and other natural disasters, such as by extending filing deadlines. Rep. John Conyers (D-MI), the ranking Democrat on the HJC, also spoke in support of the bill. This bill provides that the Director of the U.S. Patent and Trademark Office (USPTO) "may waive statutory provisions governing the filing, processing, renewal, and maintenance of patents, trademark registrations, and applications therefor to the extent that the Director deems necessary in order to protect the rights and privileges of applicants and other persons affected by an emergency or a major disaster ..."
The bill adds that "A decision not to exercise, or failure to exercise, the waiver authority provided by this subsection shall not be subject to judicial review." There was no issue of the TLJ Daily E-Mail Alert on Wednesday, March 15, 2006. The House will meet at 10:00 AM for legislative business. It may consider HR 1606, the "Online Freedom of Speech Act", subject to a rule. See, Republican Whip Notice. The Senate will meet at 10:00 AM. It will resume consideration of SConRes 83, the budget resolution. 9:00 AM. The Senate Judiciary Committee (SJC) may hold an executive business meeting. The agenda includes consideration of the nominations of Randy Smith (to be a Judge of the U.S. Court of Appeals for the 9th Circuit), Patrick Joseph Schiltz (Judge of the U.S. District Court for the District of Minnesota), Steven Bradbury (Assistant Attorney General in charge of the Office of Legal Counsel), John Clark (Director of the U.S. Marshals Service), and David Kustoff (U.S. Attorney for the Western District of Tennessee). The agenda also includes consideration of S 1768, to permit the televising of open sessions of the Supreme Court, and S 829, a bill regarding "photographing, electronic recording, broadcasting, or televising to the public of court proceedings". The SJC frequently cancels or postpones meetings without notice. Press contact: Blain Rethmeier (Specter) at 202 224-5225, David Carle (Leahy) at 202 224-4242 or Tracy Schmaler (Leahy) at 202 224-2154. Location: Mansfield Room (Room 207), Capitol Building. 9:00 AM - 4:30 PM. The Library of Congress's (LOC) Section 108 Study Group will hold the second of two round table meetings. 17 U.S.C. � 108, titled "Limitations on exclusive rights: Reproduction by libraries and archives", provides exemptions from liability for infringement for libraries and archives. The LOC published a notice in the Federal Register that states that this meeting relates "primarily to eligibility for the section 108 exceptions and copies made for purposes of preservation and replacement". This notice also states that requests to participate in must be received by 5:00 PM EST on February 24. See, Federal Register, February 15, 2006, Vol. 71, No. 31, at Pages 7999-8002. Location: Room 2237, Rayburn Building, Capitol Hill. 9:30 AM. The Senate Finance Committee's (SFC) Subcommittee on International Trade will hold a hearing titled "Cuno and Competitiveness: Where to Draw the Line". The witnesses will be Sen. George Voinovich (R-OH), Peter Enrich (Northeastern University School of Law), Harley Duncan (Federation of Tax Administrators), Walter Hellerstein (University of Georgia School of Law), Peter Fisher (University of Iowa), and James Renzas (Location Management Services). See, SFC notice and opinion of the U.S. Court of Appeals (6thCir) in Cuno v. DaimlerChrysler, 386 F.3d 738. Location: Room 215, Dirksen Building. 9:30 AM. The House Appropriations Committee's Subcommittee on Transportation, Treasury, and Housing and Urban Development, The Judiciary, District of Columbia will hold a hearing on the federal judiciary. The witnesses will be Judge Julia Gibbons (U.S. Court of Appeals for the 6th Circuit) and Leonidas Mecham (Director of the Administrative Office of the U.S. Courts). Location: Room 2358, Rayburn Building. RESCHEDULED FOR MARCH 31. 9:30 AM. Federal Communications Commission (FCC) Commissioner Deborah Tate will hold a news conference. The FCC's notice states that this is a "briefing for members of the media" and that attendees should RSVP to Meribeth McCarrick at 202-418-0654 or Meribeth dot McCarrick at fcc dot gov. Location: FCC, Room 8A204, 445 12th St., SW.
10:00 AM. The Anti Phishing Working Group APWG) will host a press conference For more information, contact Barbara Span at 202 296-9805. Location: West Room, National Press Club, 529 14th Street, NW. 2:00 PM. The House Appropriations Committee's Subcommittee on Science, the Departments of State, Justice, and Commerce, and Related Agencies will hold a hearing on the Securities and Exchange Commission (SEC). Location: Room H-309, Capitol Building. 3:00 PM. The Senate Commerce Committee will meet. The agenda includes markup of S 2389, the "Protecting Consumer Phone Records Act", and consideration of the nominations of Robert McDowell to be a member of the Federal Communications Commission (FCC) and Robert Cresanti to be Undersecretary of Commerce for Technology. Press contact: Melanie Alvord (Stevens) at 202 224-8456, Aaron Saunders (Stevens) at 202 224-3991, or Andy Davis (Inouye) at 202 224-4546. Location: Room S-128, Capitol Building. 9:00 AM. The Senate Judiciary Committee (SJC) may hold an executive business meeting. The SJC frequently cancels or postpones meetings without notice. Press contact: Blain Rethmeier (Specter) at 202 224-5225, David Carle (Leahy) at 202 224-4242 or Tracy Schmaler (Leahy) at 202 224-2154. Location: Mansfield Room (Room 207), Capitol Building. 2:30 - 4:30 PM. The American Enterprise Institute (AEI) will host a panel discussion titled "Scientific Talent and U.S. Economic Leadership". The speakers will be Richard Freeman (Harvard), Steven Davis (AEI), David Weinstein (Columbia), and Kevin Hassett (AEI). Freeman will discuss his paper titled "Does Globalization of the Scientific/Engineering Workforce Threaten U.S. Economic Leadership?". See, notice. For more information, contact Chris Pope at cpope at aei dot org or Veronique Rodman (reporters) at vrodman at aei dot org. (This event had previously been scheduled for January 13, 2006.) Location: 12th floor, 1150 17th St., NW. The House will not meet on Monday, March 20, through Friday, March 24. The Majority Whip's calendar identifies this as a "St. Patrick's Day District Work Period". Day one of a two day conference hosted by the National Institute of Standards and Technology (NIST) and the Federal Information Systems Security Educators' Association (FISSEA) titled "FISSEA Conference: Training for a Cyber-Secure Future". See, notice. Location: Bethesda North Marriott Hotel and Conference Center, 5701 Marinelli Road, North Bethesda, MD. The Supreme Court will hear oral argument in Laboratory Corp. v. Metabolite Laboratories, Sup. Ct. No. 04-607. See, Supreme Court calendar [PDF], Supreme Court docket, June 8, 2004, opinion [PDF] of the Court of Appeals (FedCir), and story titled "Supreme Court Grants Certiorari in LabCorp v. Metabolite" in TLJ Daily E-Mail Alert No. 1,244, November 1, 2005. Arguments begin at 10:00 AM. This case is second on the schedule. 9:30 AM. The U.S. Court of Appeals (DCCir) will hear oral argument in Complx Covad Comm Co v. FCC, App. Ct. No. 05-1095. Judges Ginsburg, Sentelle and Griffith will preside. Location: Prettyman Courthouse, 333 Constitution Ave., NW. Day two of a two day conference hosted by the National Institute of Standards and Technology (NIST) and the Federal Information Systems Security Educators' Association (FISSEA) titled "FISSEA Conference: Training for a Cyber-Secure Future". See, notice. Location: Bethesda North Marriott Hotel and Conference Center, 5701 Marinelli Road, North Bethesda, MD. Day one of a four day event hosted by the National Institute of Standards and Technology's (NIST) Optical Technology Division titled "Spectroradiometry Short Course". See, notice. Location: 100 Bureau Drive, Gaithersburg, MD. 6:00 - 8:15 PM. The Federal Communications Bar Association (FCBA) will host a continuing legal education (CLE) seminar titled "DTV: The Hard Date is Set -- What�s Next?" The speakers will include Eloise Gore (Assistant Chief of the FCC's Media Bureau's Policy Division), David Donovan (MSTV), John Orlando (CBS), and Peter Tannenwald (counsel to the Community Broadcasters Association). See, registration form [PDF]. The price to attend ranges from $75-$150. Reservations and cancellations are due by 5:00 PM on March 20. Location: Dow Lohnes & Albertson, Suite 800, 1200 New Hampshire Ave., NW.